Note: Orders containing cuttings may not be shipped the Tuesday following payment received as per usual procedure. This is due to the cactus being cut to order and dry weather is required to ensure rot does not occur. Your cutting needs to be callused before it is ready for planting. Keep the cutting dry for a week or two until the cut end has formed a callous, you can use a little sulfur on the end to help with drying and to protect it rot but it isn't a necessity. Once calloused you can plant your cutting. 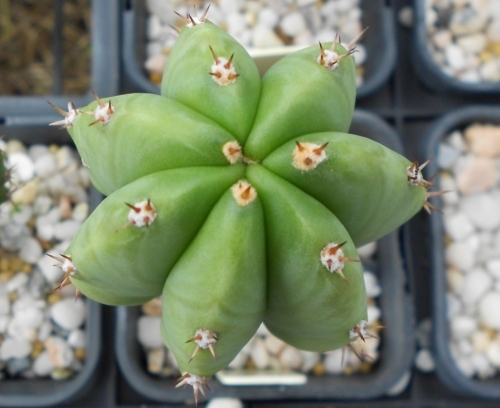 The process works any time of year, but cactus cuttings potted in late summer to early autumn root fastest. Fill an adequate sized pot with specialty cactus soil or mix your own from scratch with extra grit added, course sand, perlite, scoria, or pumice gives the soil the appropriate drainage and aeration. Plant the callused cutting in the prepared potting mix and top dress to prevent soil loss. Once potted keep dry, no not water! Most cactus cuttings root in four to six weeks.